Enjoy ultimate connectivity and smartness at your home with a powerful mesh WiFi router that is also a SmartThings Hub. The SmartThings WiFi uses Plumeâs Adaptive Home WiFi technology to learn how you use your WiFi and optimizes your network to fill every inch of your home with the strongest possible signal. It also operates as a SmartThings Hub connecting lights, cameras, locks, thermostats, sensors, and more. Automate your smart home, and control it from anywhere with the SmartThings app, Google Assistant, or Amazon Alexa Start with one SmartThings WiFi to cover homes up to 1,500 sq. feet in size and then simply add up to 32 hubs to expand your coverage. In contrast to traditional routers, the SmartThings WiFiâs mesh network can use combination of different channels and band for each data hop, taking your WiFi through the fastest route and eliminating interference, congestion, and buffering. SmartThings WiFi is simple to install and easy to use. Personalize who gets on your WiFi network, for how long, and what they can do. Measure the speed of your network, create schedules for when devices can access the internet, and much more. Plus, youâll never have to worry about updating firmwareâSmartThings WiFi will update automatically. Includes: DC Adapter(s), LAN cable(s), and QSG Leaflet *Product not supported outside U.S. *Not compatible with Samsung Connect Home models ET-WV520KWEGUS, ET-WV520BWEGUS, and ET-WV530BWEGUS. SmartThings mesh wifi is a true excellent solution if you have a multi-level dwelling and Wi-Fi coverage issues. I have a 4000 square foot home in Chicago northern suburbs and I am also smartThings user and have about 30 smart home sensors and gadgets on my home network. I have used many types of router devices in my home to improve wifi coverage. Apple Airport, Netgear Nighthawk X8, multiple router types, extenders, booster etc. SmartThings Wifi was the PERFECT choice for me. Since I have been using SmartThings Hub and sensors for three years, I was very interested in new SmartThings products – Wifi and new sensor. I bought SmartThings wifi 3pack first and reviewed carefully all materials and websites. Based upon my research that I’ve done, SmartThings wifi uses AI based mesh wifi. It adapts to home Wi-Fi in real time and deliver upgraded Wi-Fi performance every day. I realized that SmartThings wifi uses Plume’s Adaptive Wi-Fi technology and Plume is a company for Wi-Fi mesh specialty that they provided solution to Comcast and Samsung and received investment from them too. Its technology is very interesting!!!. They said that SmartThings wifi learns Wi-Fi needs and optimizes bands and channels for the best Wifi performance. It is AMAZING mesh technology with traffic balancing, as well as management radio resources. I believe it is a groundbreaking Wi-Fi technology!!! Setting up SmartThings Wifi was so simple and clear, SmartThings app automatically detected smartthings wifi and I just did click. For advanced Wifi settings. I downloaded Plume app and it showed how many Wi-Fi devices were connected on each router and band & channel I’ve been using. Graphic looked like solar systems and it was very interesting app. As time goes on, the channel and band changed. It seems SmartThings wifi takes advantage of uncongested Wi-Fi frequencies based on AI algorithm. I will post details again. I’d recommend this for people struggling with weak Wi-Fi signal, people who want to get the fast internet and people who use smart home devices like sensors, thermostat and Arlo camera. 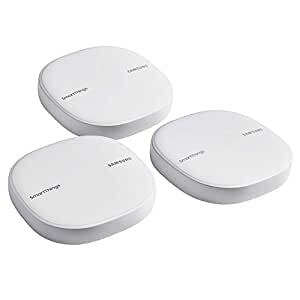 I bought three pack but a single SmartThings wifi is great as a router with a modem rather than using the gateway the internet provider rents. Easy to setup. Great coverage and decent speed. Doubles as a smart home hub. This was my first foray into “mesh” type wifi networking, and I’ve been thinking about switching over for some time because our house, while relatively small, is a tricky configuration to get good coverage. It is a single story about 1,600 sq ft but it rambles with a bunch of different roof lines, and a lot of interior walls between the two farthest corners of the house. To make things more difficult, the router closet is at one of these far corners. My existing system was a pair of latest generation Apple Airport Extreme Base Stations with the farthest unit having a hard-wired backhaul to the main router. This gave VERY good coverage at the two ends of the house (kitchen/living room and Office/TV room) with the bedrooms in between getting good coverage. Connected on my Wifi network are an HP Laserjet, a Sonos sound system, Ring doorbell and Chime, Arlo security camera system, Apple TV, and a variety of mobile devices and laptops (all Apple products). One of the things I don’t like about the AEBS is how big they are – tall white towers that are very obtrusive in a living space. The Samsung hubs are tiny in comparison and much more acceptable to my wife. Unboxing and installing the three units took about 30 minutes, but that was mostly because I had to re-arrange a bunch of wiring and install a 5-port switch in my router closet, since the Samsung units only have one “out” port on the back versus the 3 extras on the AEBS. The setup process is very simplified – If you want to set up a basic mesh network but don’t have ANY networking skills whatsoever, I think this solution can work very well for you. The installation process did not ask for any technical details, nor offer much at all in the way of configuration flexibility. Because I was not using a “traditional” installation (I had a hard-wired backhaul for the farthest unit) I was worried when I didn’t see any options for installing in this sort of fashion. But as it turned out, it “just worked” (the way Apple products used to). The WiFi functionality is all provided by Plume, who you may have read about – they received $37 million in funding last year (one of the investors was Samsung) and have a different approach to the mesh networking game. Instead of relying on raw power and size with a big array of antennae (4×4 MIMO like the Orbi) they instead rely on a much smaller form faster and 2×2 MIMO but use cloud-based software “intelligence” to optimize performance. Based on articles on ARS Technica, my reading indicates that this approach seems to work well, but with one caveat – the “regular” pods from Plume provide “middle of the road” performance as compared to other peers in the mesh networking category, but their 2nd generation “SuperPods” clearly outperform most of the peers. I notice that Samsung offers these hubs in both a “regular” AC1300 model (this one being reviewed) and a “Pro” AC2600 model, which I assume is probably based on the Plume Superpod. The Plume app is a very interesting approach to managing a WiFi network, and offers actual configuration, but nothing like what you get with a Netgear, Cisco, or even Apple product. Other than port-forwarding, IP reservations, and setting up DNS and UPnP, there are no other settings whatsoever. This is more Apple-like than even Apple’s current networking options. Supposedly, Plume takes care of everything via their cloud services (which they sell as a subscription with their own branded products – no subscription offered or required with the Samsung product). The app is much more focused on a visually appealing interface for non-technical people which makes it very easy to see what devices are connected (it identified most of them with “normal” names) and see general info about performance (apparently the system automatically tests bandwidth and performance periodically and then reports on the results via the app). My favorite feature of the app is the ability to set up two types of guest accounts very easily – you can set up an account with full network access, but specify which devices that guest can access – for example, the printer, but not the Sonos system) or you can set up “Internet only” guest passes. These guest accounts can be set to expire after a certain amount of time, or be permanent. From within the app, you can easily “push” the connection information to someone via SMS or Email, but that user will still need to copy/paste the password to their device setup. Performance-wise, so far I am seeing very similar performance to what I was seeing with my Airport Extreme Base station system. The advantages of the Samsung system are (1) much less expensive than a pair of AEBS units (2) much less obtrusive (3) ability to add more “pods” to extend the network or get better coverage in dead areas without having to run cables, and (4) SmartThings integration. I installed the system with the full expectation of reverting back to my AEBS after a bit of testing, but the performance is good enough (actually much better in some parts of the house, a bit worse in others) that I am going to leave it in place and then fiddle with some SmartThings devices, after which time I will post an updated review.